The city of Dresden is located in what many used to call “The Valley of the Ignorant.” That nickname came from the fact that this was one of the only cities in the former East Germany that could not receive Western satellite signals. Therefore, the people of Dresden had no idea of the kind of lifestyle they were missing out on, being locked far behind the Iron Curtain. When that curtain finally was lifted in 1989 and 1990, Dresdeners woke to the new reality of tourism. Those tourist Euros, the spigot of which has really opened up in the last five years, have been poured into the rebuilding of the city to turn it once again into the “Florence on the Elbe” of a hundred years ago. 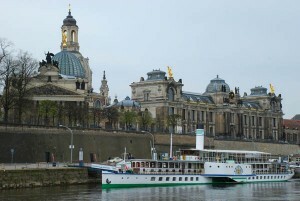 Dresden has always been a favorite destination of European Focus Private Tours. However now, with the gleaming Frauenkirche as its center point and more and better restaurants and hotels in the city center the former capital of the Saxon Princes and Kings of Poland makes for a very interesting two or three night stop. World-class museums such as the Zwinger and the Albertinum plus the famed Green Vault stuffed with the treasures of the Wettins, who ruled this part of the world for more than 800 years, makes Dresden one “wow” moment after another. This time, we tried something different with our guests and took one of the old ships of the “White Fleet” which cruise the Elbe. Our boat was built in 1893 and is still running strong thanks to a stem to stern renovation. Engines are gleaming and original, powering the two side paddles which move the boat along at a nice clip. 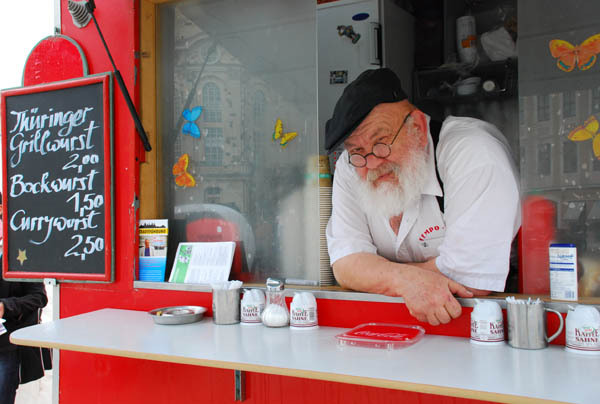 Comforts on board include a little restaurant and plenty of drinks to enjoy while the villas on the banks of the Elbe east of Dresden glide by. 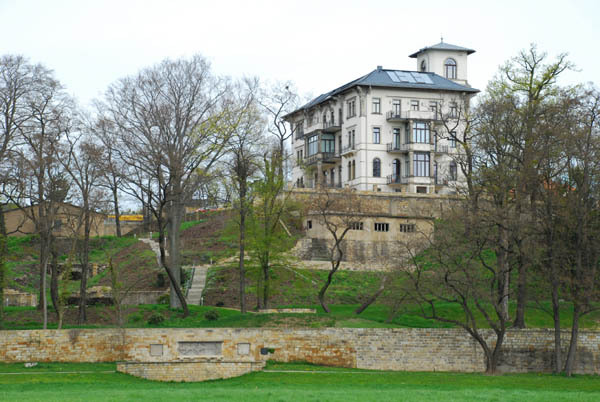 Those villas were built by friends of Dresden’s most powerful ruler, August III, starting in the 1700s and lasting right up until the early 1900s. There was just one “rule,” that no villa could look like another. This creates an interesting landscape which never gets boring during the 90 minute cruise. The miracle of the “Blue Bridge” also makes for an interesting story. 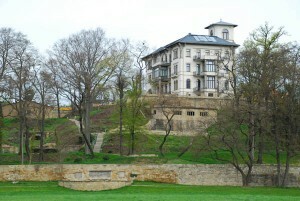 The bridge was built in the late 19th century and originally had been painted green. A defect in the paint turned the bridge blue, and the locals didn’t seem to mind. In the last days of World War II, departing German soldiers had rigged the bridge with explosives to hinder the advance of the Allies. A local man cut the wires to the detonator, and saved the bridge. It’s one of the only bridges across the Elbe to survive the war. The Frauenkirche, Dresden's signature, rebuilt the way it was in the early 1700s. 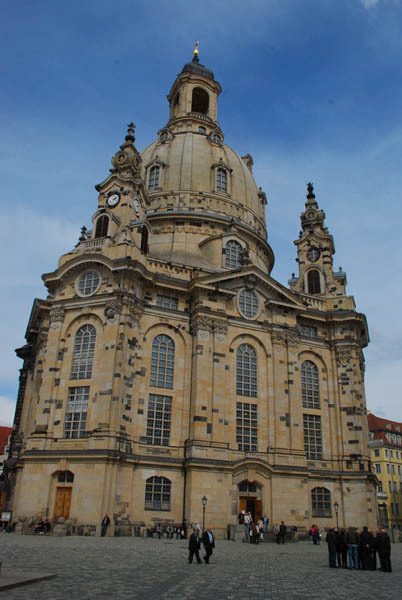 Another survivor of the war, just barely, is the Frauenkirche, the largest protestant church in Dresden. The church burned for two days after the British and the American bombers dropped their loads on Dresden’s historic center on February 13, 1945. Finally, the dome collapsed. The church was left in ruins for fifty years with sheep grazing around it until the end of Communism in this part of Germany. The plans to rebuild the church began almost immediately, with the work starting in earnest in 1990 and lasting until the rededication of the church in late October, 2005. Since then, all manner of swank hotels and restaurants and boutiques have opened in new buildings erected around the site of the Frauenkirche. What was once a medieval city center is now a rebuilt medieval city center, and the architects have done a great job of recapturing the atmosphere, right down to one building with a crazy roof angle next to a building with a more subdued one, just as it was 300 years ago. Dresden draws you in and holds you, with the climax being the dazzling display of lights illuminating its treasures at night. Through tenacity and determination, the people of Dresden have reclaimed their jewel on the Elbe River. Posted in Europe Tours, Germany Tours and tagged dresden, elbe, europe, frauenkirche, germany, of, tours.